Released in the wake of Comic-Con, it’s impossible not to deeply consider the timing and subtext of a film in which fandom has a major role and Mark Hamill plays character that shapes that fandom. Such is the undercurrent of “Brigsby Bear,” the Sundance dramedy that pivots from a dark examination of a life lived in confined culture to a celebration of creativity spawned from that culture. Neither film completely works—and the mashing of the two feels incongruent at times—but there’s a lot to like here, particularly in the daringness of the concept. If anything, I wish that debut director Dave McCary and the team behind “Brigsby Bear” had embraced their film’s oddity a bit more instead of trying to bring it to a more traditionally heartwarming place. There’s a truly subversive film buried in “Brigsby Bear”—the kind of movie that Michel Gondry or Charlie Kaufman would have made with the same idea—and it shines through just enough to warrant a look but not quite enough to elevate this into the memorable experience it could have been. 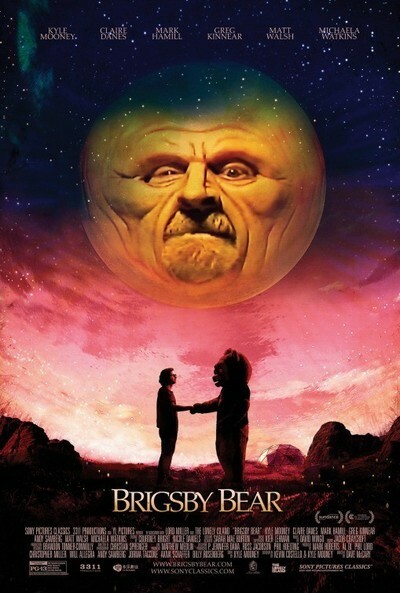 There’s a mysterious danger to the opening scenes of “Brigsby Bear.” A young man named James (Kyle Mooney of “Saturday Night Live”) lives in a room filled with posters, toys, and other collectibles related to his favorite show, “Brigsby Bear.” The program, which we see him eagerly watching on VHS tapes, looks like a relic of ‘70s or ‘80s Saturday morning television with low production values, full-frame format, and moral lessons told directly to the screen. It all looks relatively harmless, except James is way too old to be this obsessed with a kid’s show, there appears to be little else in his life, and there are no windows in his room. Something is “off.” And even the routine over dinner with his parents (Hamill & Jane Adams) has an air of menace. When we see James and his father venturing out of their underground bunker of a home in gas masks, the assumption is that this is another post-apocalyptic tale—the story of a boy devouring the only pop culture left in a world gone mad. That’s not quite it. We quickly learn that James was kidnapped when he was just an infant, and has been held in this bunker and essentially brainwashed. Taking this dark set-up a step further, James discovers that the show that helped form his worldview was created by his father in a warehouse and that literally no one else has seen it. Even the people he thought he was speaking to on a Brigsby Bear forum were fake. So not only does he enter a real world that he doesn’t understand—including his real family played well by Michaela Watkins, Matt Walsh, and Ryan Simpkins—but he does so without the support of the only thing he’s ever known. Imagine being the biggest “Star Wars” fan in the world and then being told that you have to go somewhere where no one has ever heard of The Force. It creates a different level of disconnect for James. McCary and his writers (Mooney & Kevin Costello) aren’t really interested in that disconnect. Sure, there are a few scenes with a cop played by Greg Kinnear and a therapist played by Claire Danes that work James’ oddity for laughs, but that angle is quickly discarded for a film that’s primarily about the power of creativity. If you’re wondering how a film about pop culture obsession and kidnapping becomes an ode to filmmaking, it doesn’t quite do so successfully. “Brigsby Bear” becomes a film about a boy who doesn’t overcome his obsession as much as embrace it. That’s a fascinating message as well—it is not that our fandom will destroy us but that it will save us—but McCary and Mooney don’t embrace the stakes of the piece enough for it to register. I wanted more danger, more tension, more drama, and less "James having fun with his new friends." It often feels as if “Brigsby Bear” has such an “unusual” concept that the creators were then scared to lean into it, making everything about its delivery feel like it’s designed to soften the sharp edges and lighten its darker tones. “Brigsby Bear” would be a tough tonal balancing act for anyone to pull off, much less a debut filmmaker, and it’s certainly unlike anything else you’ll see this year, definitely during blockbuster season. It’s the kind of movie that’s easy to embrace for its unique subject matter, and hard to hate given how much it emboldens the creative spirit—it will make you want to draw, film, write, or create something when it’s over. These are the qualities that will make this an important film for people in the way the show-within-a-movie is important for its protagonist. It almost makes a critic who wishes for something more feel as villainous as the show’s bad guy, Sun Snatcher. Trust me, I wanted to embrace my inner Brigsby or even the kid within me once (and still kinda) obsessed with film, comics, games, and television like the loyal travelers to Comic-Con. I just needed more than whimsy to make that cinematic journey to pop culture nirvana.